If Santa had a track record in paying his temporary elves the minimum wage while pushing them to the limits of the EU working time directive, and sacking them if they take three sick breaks in any three-month period, this would be an apt comparison. It is probably reasonable to assume that tax avoidance is not “constitutionally” a part of the Santa business model as Brad Stone, the author of a new book on Amazon,The Everything Store: Jeff Bezos and the Age of Amazon, tells me it is in Amazon’s case. Neither does Santa attempt to bully his competitors, as Mark Constantine, the founder of Lush cosmetics, who last week took Amazon to the high court, accuses it of doing. Santa was not called before the Commons public accounts committee and called “immoral” by MPs. For a week, I was an Amazon elf: a temporary worker who got a job through a Swansea employment agency – though it turned out I wasn’t the only journalist who happened upon this idea. Last Monday, BBC’sPanorama aired a programme that featured secret filming from inside the same warehouse. I wonder for a moment if we have committed the ultimate media absurdity and the show’s undercover reporter, Adam Littler, has secretly filmed me while I was secretly interviewing him. He didn’t, but it’s not a coincidence that the heat is on the world’s most successful online business. Because Amazon is the future of shopping; being an Amazon “associate” in an Amazon “fulfilment centre” – take that for doublespeak, Mr Orwell – is the future of work; and Amazon’s payment of minimal tax in any jurisdiction is the future of global business. A future in which multinational corporations wield more power than governments. At the end of my first day, I log into my Amazon account. I’d left my mum’s house outside Cardiff at 6.45am and got in at 7.30pm and I want some Compeed blister plasters for my toes and I can’t do it before work and I can’t do it after work. My finger hovers over the “add to basket” option but, instead, I look at my Amazon history. I made my first purchase, TheRough Guide to Italy, in February 2000 and remember that I’d bought it for an article I wrote on booking a holiday on the internet. It’s so quaint reading it now. It’s from the age before broadband (I itemise my phone bill for the day and it cost me £25.10), when Google was in its infancy. It’s littered with the names of defunct websites (remember Sir Bob Geldof’sdeckchair.com, anyone?). It was a frustrating task and of pretty much everything I ordered, only the book turned up on time, as requested. The Observer’s Carole Cadwalladr outside the warehouse where she worked for a week. Photograph: Stephen Shepherd for the ObserverAnd then there’s “Les”, who is one of our trainers. He has a special, coloured lanyard that shows he’s an Amazon “ambassador”, and another that says he’s a first aider. He’s worked at the warehouse for more than a year and over the course of the week I see him, speeding across the floor, going at least twice the rate I’m managing. He’s in his 60s and tells me how he lost two stone in the first two months he worked there from all the walking. We were told when we applied for the jobs that we may walk up to 15 miles a shift. He’d been a senior manager in the same firm for 32 years before he was made redundant and landed up here. How long was it before you got a permanent job, I ask him. “I haven’t,” he says, and he holds up his green ID badge. Permanent employees have blue ones, a better hourly rate, and after two years share options, and there is a subtle apartheid at work. It’s worth noting that agency workers are not Amazon employees. There’s no doubt that it is hard, physical work. The Panoramadocumentary majored on the miles that Adam walked, the blisters he suffered, the ridiculous targets, and the fact that you’re monitored by an Orwellian handset every second of every shift. As an agency worker, you’re paid 19p an hour over the minimum wage – £6.50 – and the shifts are 10½ hours long. But lots of jobs involve hard, physical work. That’s not the thing that bothers people. Almost everybody remains stoical in the face of physical discomfort and exhaustion. And they’re Welsh: there’s a warmth and friendliness from almost everyone who works there. My team leader is no corporate droid. He started on the shop floor, sounds like Richard Burton, and is gently encouraging. And yet. An unfairness that has no outlet. In the wake of the BBC documentary, Hywel Francis, the MP for Aberavon, managed to get a meeting last week with Amazon’s director of public policy, a meeting he’s been trying to get for years. He’s reluctant to speak about the complaints he’s heard from his constituents but says that “the plant is exceptional in the local area in having no union representation. It’s been a long haul to even get in there and find out what is going on.” It’s been a black hole where the lack of any checks upon its power has left a sense that everything is pared to the absolute bone – from the cheapest of the cheap plastic safety boots, which most long-term employees seem to spend their own money replacing with something they can walk in, to the sack-you-if-you’re-sick policy, to the 15-minute break that starts wherever you happen to be in the warehouse. On my third morning, at my lowest point, when my energy has run out and my spirits are low, it takes me six minutes to walk to the airport-style scanners, where I spend a minute being frisked. I queue a minute for the loos, get a banana out of my locker, sit down for 30 seconds, and then I get up and walk the six minutes back to my station. 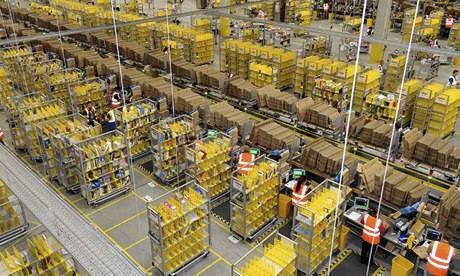 To work at Amazon is to spend your days at the coalface of consumerism. To witness our lust for stuff. This year’s stuff includes great piles of Xboxes and Kindles and this season’s Jamie Oliver cookbook, Save With Jamie (you want to save with Jamie? Don’t buy his sodding book), and Paul Hollywood’s Pies & Puds, and Rick Stein’s India. The celebrity chef cookbooks incense me. They don’t even bother taking them out of the boxes. They lie in great EU butter mountain-sized piles at the ends of the aisle. Cook an egg on the telly and it’s like being given a licence to print money for all eternity. The vast majority of people working in the warehouse are white, Welsh, working class, but I train with a man who’s not called Sammy, and who isn’t an asylum seeker from Sudan, but another country, and I spend an afternoon explaining to him what the scanner means when it tells him to look for a Good Boy Luxury Dog Stocking or a Gastric Mind Band hypnosis CD. It’s the Barbie Doll girl’s Christmas advent calendar, however, that nearly breaks me. I traipse back and forth to section F, where I slice open a box, take another Barbie advent calendar, unpick the box and put it on the recycling pile, put the calendar, which has been shipped from China, passed from the container port to a third-party distributor and from there to the Amazon warehouse, on to my trolley and pass it to the packers, where it will be repackaged in a different box and finally reach its ultimate destination: the joy in a small child’s heart. Because nothing captures the magic of Christmas more than a picture of a pneumatic blonde carrying multiple shopping bags. You can’t put a price on that (£9.23 with free delivery). 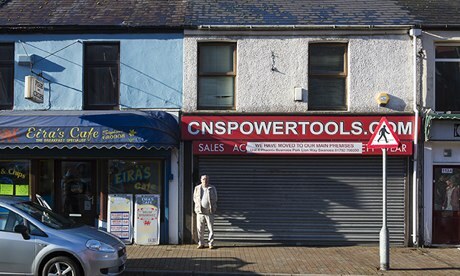 Amazon’s arrival has coincided with the decline of the high street in nearby town Briton Ferry. Photograph: Stephen Shepherd for the ObserverWe want cheap stuff. And we want to order it from our armchairs. And we want it to be delivered to our doors. And it’s Amazon that has worked out how to do this. Over time, like a hardened drug user, my Amazon habit has increased. In 2002, I ordered my first non-book item, a This Lifeseries 1 video; in 2005, my first non-Amazon product, a secondhand copy of a biography of Patricia Highsmith; and in 2008, I started doing the online equivalent of injecting intravenously, when I bought a TV on the site. “We are the most customer-centric company on earth,” we’re told in our induction briefing, shortly before it’s explained that if we’re late we’ll get half a point, and after three of them we’re out. What constitutes late, I ask. “A minute,” I’m told. I grew up in South Wales and saw first-hand how the 1980s recession slashed a brutal gash through everything, including my own extended family. I’ve always known that there’s only a tissue-thin piece of luck between very different sorts of lives. But then my grandfather worked in a warehouse in Swansea. In my case, there really is only a tissue-thin piece of luck between me and an Amazon life. I have a lot of time to think about this during my 10½-hour day. At the Neath working men’s club down the road, one of the staff tells me that Amazon is “the employer of last resort”. It’s where you get a job if you can’t get a job anywhere else. And it’s this that’s so heartbreaking. What did you do before, I ask people. And they say they’re builders, hospitality managers, marketing graduates, IT technicians, carpenters, electricians. They owned their own businesses, and they were made redundant. Or the business went bust. Or they had a stroke. Or their contract ended. They are people who had skilled jobs, or professional jobs, or just better-paying jobs. And now they work for Amazon, earning the minimum wage, and most of them are grateful to have that. Amazon isn’t responsible for the wider economy, but it’s the wider economy that makes the Amazon model so chilling. It’s not just the nicey nice jobs that are becoming endangered, such as working in a bookshop, as Hugh Grant did in Notting Hill, or a record store, as the hero did in Nick Hornby’s High Fidelity, or the jobs that have gone at Borders and Woolworths and Jessops and HMV, it’s pretty much everything else too. Next in line is everything: working in the shoe department at John Lewis, or behind the tills at Tesco, or doing their HR, or auditing their accounts, or building their websites, or writing their corporate magazines. Swansea’s shopping centre down the road is already a planning disaster; a wasteland of charity shops and what Sarah Rees of Cover to Cover bookshop calls “a second-rate Debenhams and a third-rate Marks and Spencer”. In the UK, I point out, everyone already delivers groceries: Tesco, Asda, Waitrose, Sainsbury’s. “I suspect they’ll acquire,” he says. And everywhere it kills jobs. Shops employ 47 people for every $10m in sales, according to research done by a company called ILSR. Amazon employs only 14 people per $10m of revenue. In Britain, it turned over £4.2bn last year, which is a net loss of 23,000 jobs. 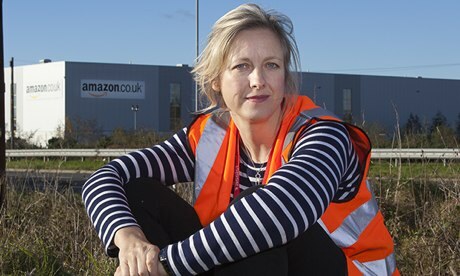 And even the remaining jobs, the hard, badly paid jobs in Amazon’s warehouses, are hardly future-proof. Amazon has just bought an automated sorting system called Kiva for $775m. How many retail jobs, of any description, will there be left in 10 years’ time? Our lust for cheap, discounted goods delivered to our doors promptly and efficiently has a price. We just haven’t worked out what it is yet. It’s taxes, of course, that pay for the roads on which Amazon’s delivery trucks drive, and the schools in which its employees are educated, and the hospitals in which their babies are born and their arteries are patched up, and in which, one day, they may be nursed in their dying days. Taxes that all its workers pay, and that, it emerged in 2012, it tends not to pay. On UK sales of £4.2bn in 2012, it paid £3.2m in corporation tax. In 2006, it transferred its UK business to Luxembourg and reclassified its UK operation as simply “order fulfilment” business. The Luxembourg office employs 380 people. The UK operation employs 21,000. You do the math. Brad Stone tells me that tax avoidance is built into the company’s DNA. From the very beginning it has been “constitutionally oriented to securing every possible advantage for its customers, setting the lowest possible prices, taking advantage of every known tax loophole or creating new ones”. It’s something that Mark Constantine, the co-founder of Lush cosmetics, has spent time thinking about. He refuses to sell through Amazon, but it didn’t stop Amazon using the Lush name to direct buyers to its site, where it suggested alternative products they might like. “It’s a way of bullying businesses to use their services. And we refused. We’ve been in the high court this week to sue them for breach of trademark. It’s cost us half a million pounds so far to defend our business. Most companies just can’t afford that. But we’ve done it because it’s a matter of principle. They keep on forcing your hand and yet they don’t have a viable business model. The only way they can afford to run it is by not paying tax. If they had to behave in a more conventional way, they would struggle. It’s a mirror image of what is happening on the shop floor. Just as Amazon has eroded 200 years’ worth of workers’ rights through its use of agencies and rendered a large swath of its workers powerless, so it has pulled off the same trick with corporate responsibility. MPs like to slag off Amazon and Starbucks and Google for not paying their taxes but they’ve yet to actually create the legislation that would compel them to do so.